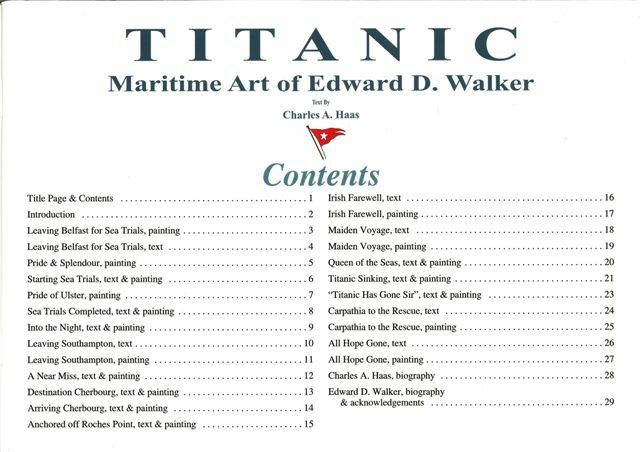 As artist for the RMS Titanic International Artefacts Exhibition, Edward “Ted” D. Walker created eighteen, original, oil paintings depicting the Titanic story. 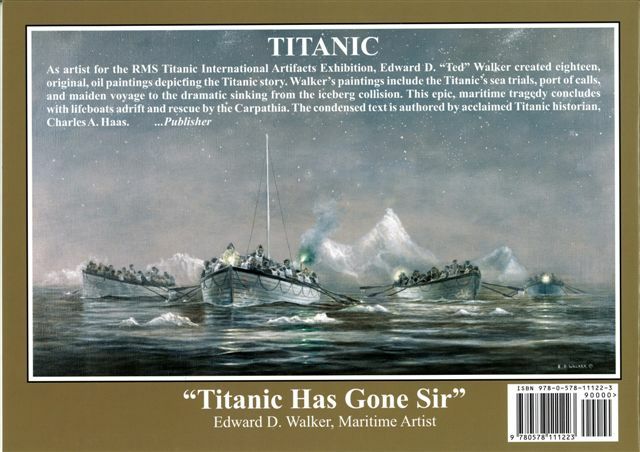 Edward Walker’s paintings include the Titanic’s sea trials, ports of call, and maiden voyage to the dramatic sinking from the iceberg collision. This epic, maritime tragedy concludes with lifeboats adrift and rescue by the Carpathia. Ted’s unique collection of Titanic paintings comprise the world’s most authentic gallery depicting the Titanic story. The paintings were created after extensive research. Walker is classed as a professional, maritime artist noted for his authenticity and attention to detail. Walker’s professional career spans 50 years and his art can be found in public, private and royal collections worldwide. The UK’s Royal Mail and the Cunard Line are among Walker’s prestigious clients. 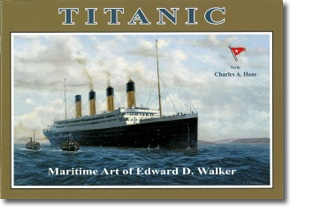 This book is authored by acclaimed Titanic historian, Charles A. Haas. The condensed text was created especially for Walker’s eighteen paintings illustrating the Titanic story. Charles A. Haas and John P. Eaton have co-authored the critically acclaimed Titanic: Triumph and Tragedy, as well as, Titanic: Destination Disaster and Titanic: A Journey Through Time. Haas is the world’s first teacher and historian to complete two dives to the Titanic’s wreck site. This educational book can be enjoyed by all ages including middle school students. This is a wonderful introductory book to the Titanic story, as well as, any person whose life has been touched by this tragedy. In this book, the artist and author memorialise and honour those persons who designed and constructed this famous, majestic ship, as well as, those persons who lost their lives during the tragic maiden voyage. TITANIC, Walker’s second book was published by Sumar Publications in September 2012. This full colour book, size 8.5” x 12”, bound by soft-cover, is comprised of twenty nine pages.